MagnaFlow Hot Rod Kit UNIVERSAL - Dezod Motorsports Inc - Home of the automotive performance enthusiast since 2002. Whether you’re a proven hot rod builder like Chip Foose or someone working on a project in your home garage, the MagnaFlow Performance Exhaust Custom Builder/Hot Rod Kit is the perfect starting point for your one-off exhaust system. When ‘off the shelf’ won’t cut it, our kits are there to help you create an exhaust system to fit your needs. Designed to include all of the basic building blocks needed for your system, including an array of hangers and flanges, as well as, straight pipes, and mandrel-bent J-, U- and L-bends, you can piece together your custom exhaust however you choose. 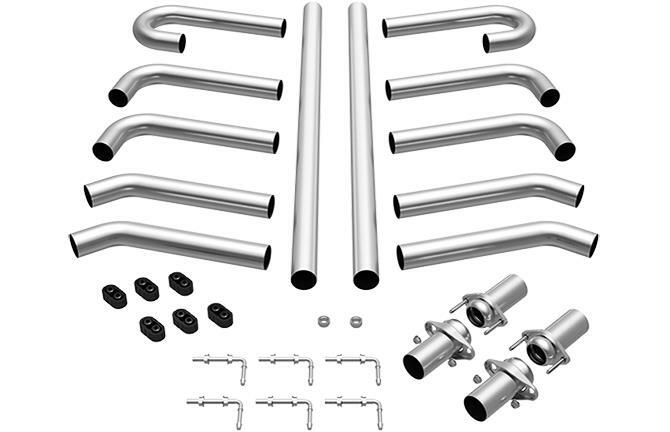 MF Custom builder pipe kits are a pipe only design exhaust system with all the necessary tubing and hangers to install giving the user the opportunity to select their own muffler and tip best suited for that application. Available in various diameters and backed by MagnaFlow’s Lifetime Warranty, there is no reason to go any other route. Be sure to include a set of polished MagnaFlow performance mufflers to finish that truly one-off exhaust system.